A shopkeeper rolls out an awning at the beginning of the workday; a family gathers under a porch awning on a late summer afternoon. These are familiar and compelling images of earlier urban and residential life in America. For two centuries, awnings not only played an important functional role, they helped define the visual character of our streetscapes. Yet, compared to historic photographs of downtowns and neighborhoods with myriad awnings, today's streets often seem plain and colorless. 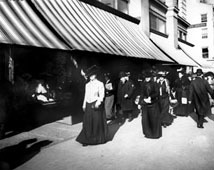 Storefront awnings over sidewalks and entrances were typical features of American streetscapes for much of the 19th and 20th centuries. 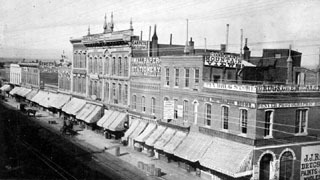 Photo of Larimer Street, Denver, Colorado, © 1870, Denver Public Library, Western History Collection, x-22058. Throughout their history, awnings have had great appeal. Along with drapes, curtains, shutters, and blinds they provided natural climate control in an age before air conditioning and tinted glass. By blocking out the sun's rays while admitting daylight and allowing air to circulate between interior and exterior, they were remarkably efficient and cost effective. Awnings permitted window-shopping on rainy days; they protected show window displays from fading due to sunlight. On the primary facade and near eye level, they were central to a building's appearance. Manufacturers came up with attractive, attention-getting awnings featuring distinctive stripes, ornate valances, and painted lettering and logos. With a wide range of color and pattern choices, owners could select an awning that complemented the building and get both style and function in a relatively affordable package. In recent years, building owners and others interested in historic buildings have rediscovered awnings. Local "main street" preservation programs encouraging-and in some cases funding-rehabilitation work have helped spur the awning's return. 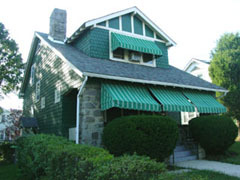 Awnings were an easy way to dress up and distinguish homes of virtually any style. Image: Otis Awning Fabrics Company brochure, © 1920s. Continued concerns over energy efficiency have also persuaded building owners and developers to use awnings to reduce heat gain, glare, and cooling costs. Because awnings were so common until the mid-twentieth century, they are visually appropriate for many historic buildings, unlike some other means of energy conservation. 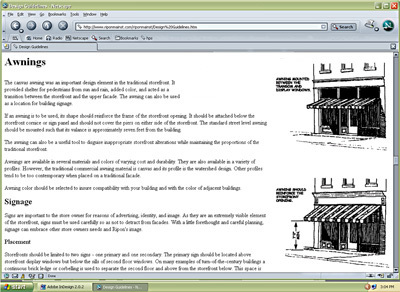 This Preservation Brief provides historical background information about diverse awning applications in the United States; suggests ways that historic awnings can best be maintained, repaired, and preserved; and recommends the varying circumstances in which replacement in kind, or new awning design may be appropriate for historic buildings. Awnings are remarkable building features that have changed little over the course of history. Records dating back to ancient Egypt and Syria make note of woven mats that shaded market stalls and homes. In the Roman Empire, large retractable fabric awnings sheltered the seating areas of amphitheatres and stadiums, including the Coliseum. The Roman poet Lucretius, in 50 B.C., likened thunder to the sound that "linen-awning, stretched, o'er mighty theatres, gives forth at times, a cracking roar, when much 'tis beaten about, betwixt the poles and cross-beams." Over the next two millennia awnings appeared throughout the world, while the technology used in their construction changed little. 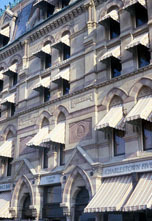 Early 19th century awnings featured canvas coverings stretched between the building facade and post-supported front bars. Projecting frameworks of extension bars were not common until later in the century. 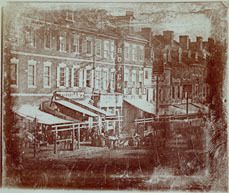 Photo: Second Street, Philadelphia, © 1841, Print and Photo Collection, The Free Library of Philadelphia. When awnings began to commonly appear on American storefronts-during the first half of the 19th century-they were simple, often improvised and strictly utilitarian assemblies. The basic hardware consisted of timber or cast iron posts set along the sidewalk edge and linked by a front cross bar. To lend support to larger installations, angled rafters linked the front cross bar to the building facade. The upper end of the canvas was connected to the facade with nails, with grommets and hooks, or by lacing the canvas to a headrod bolted to the facade. The other (projecting) end of the canvas was draped over, or laced to, a front bar with the edge often hanging down to form a valance. On ornate examples, metal posts were adorned with filigree and the tops decorated with spear ends, balls or other embellishments. On overcast days or when rain did not threaten, the covering was often rolled up against the building facade; during the winter months proper maintenance called for the removal and storage of awnings. Photographs from the mid-1800s often show the bare framework, suggesting that the covering was extended only when necessary. Canvas duck was the predominant awning fabric. A strong, closely woven cotton cloth used for centuries to make tents and sails, canvas is a versatile material with a relatively short lifespan compensated for by its low cost. During the second half of the 19th century, iron plumbing pipe became a popular material for fixed awning frames. Here, a pipe frame without its canvas cover extends around the corner of a building in Washington, D.C. Photo: Library of Congress, Prints and Photographic Division, LC-USZ62-121160. 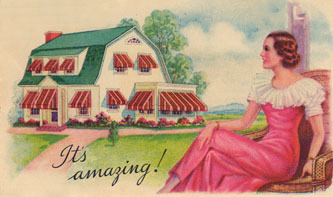 Awnings became a common feature in the years after the Civil War. Iron plumbing pipe, which was quickly adapted for awning frames, became widely available and affordable as a result of mid-century industrialization. It was a natural material for awning frames, easily bent and threaded together to make a range of different shapes and sizes. At the same time the advent of the steamship forced canvas mills and sail makers to search for new markets. An awning industry developed offering an array of frame and fabric options adaptable to both storefronts and windows. In the second half of the 19th century, manufactured operable awnings grew in popularity. Previously, most awnings had fixed frames-the primary way to retract the covering was to roll it up the rafters by hand. Operable systems for both storefront and window awnings had extension arms that were hinged where they joined the facade. 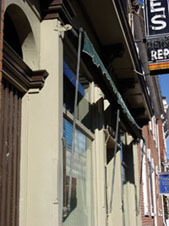 The arms were lowered to project the awning or raised to retract the awning using simple rope and pulley arrangements. Because the canvas remained attached to the framework, retractable awnings allowed a more flexible approach to shading-shopkeepers and owners could incrementally adjust the amount of awning coverage depending upon the weather conditions. When the sun came out from behind clouds, the awning could be deployed with ease. In case of sudden storms, owners could quickly retract the awning against the building wall where it was protected from wind gusts. A 19th century shoe store in Richmond, Virginia had an operable awning retracted against the building facade. Hinged extension arms were raised and lowered allowing for an awning configuration easily changed in response to weather conditions. 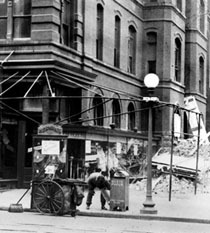 This photo shows how the fabric gathered and was exposed to the elements when retracted - part of the reason roller awnings later became prevalent. Photo: Library of Congress, Prints and Photographic Division, LC-USZ62-99053. But the early operable awnings had their own drawbacks. When retracted, the coverings on early operable awnings bunched up against the building facade where it was still partially exposed to inclement weather. (In fact, deterioration was often accelerated as moisture pooled in the fabric folds.) Also, the retracted fabric often obscured a portion of the window or door opening and unless it was folded carefully, presented an unkempt appearance. Addressing the drawbacks of the original hinged awning, new roller awnings featured a wood or metal cylinder around which the canvas was stored when the awning was retracted. When fully retracted, only the valance was visible. The roller was usually bolted to a backboard set against the building and protected beneath a wood or galvanized metal hood. In some cases it was installed in a recessed box built into the facade. A long detachable handle (called a "winding brace"), or a gearbox and crankshaft attached to the building, was used to turn the roller. Some later models were operated by electric motor. Rollers, especially those on window awnings, often contained a spring that helped retract the awning and kept the canvas from sagging excessively. The roller bar at the top of a fixed-arm awning is cranked to release the fabric. As the canvas unfurls the vertical arms swing downward from their lower point. Because the pictured awning had a large projection, extending far from the building wall, the lower hinges were mounted on vertical slide rods affixed to the facade. When the awning is lowered, the bottom hinges of the arms travels up the slide rod to increase headroom beneath the fully extended awning. Photo: NPS files. 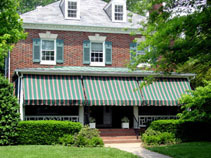 Most 19th century roller awnings had fixed arms that were similar to those found on the earlier operable awnings. The arms hinged flush to the building when the awning was retracted and, with the help of gravity, straightened out over the sidewalk when extended. 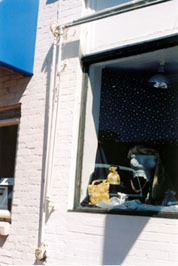 When a storefront awning's projection exceeded its drop by more than a foot, its long arms were connected to an adjustable slide rod rather than hinged directly to the building facade-increasing head room along the sidewalk. An expanded variety of available canvas colors, patterns, and valance shapes also appeared during this period. Some coverings were dyed a solid color; shades of slate, tan, and green were especially popular. Others had painted stripes on the upper surface of the canvas. Awning companies developed a colorful vocabulary of awning stripes that enhanced the decorative schemes of buildings, and in some cases, served as a building's primary decorative feature. A wide selection of striped patterns took the awning beyond its original, utilitarian function to serve as a decorative and appealing building feature. Photo: Library of Congress, Prints and Photographic Division, LC-D4-62072. The broader choice of frame and canvas options encouraged the reassessment of awnings simply as a means to provide shelter from rain and sun. Homeowners found that the new generation of awnings could enhance exterior paint schemes and increase the visual appeal of their homes. Manufacturers developed new awning shapes, colors, patterns and hardware to fit different house, door, window and porch styles. They were an affordable, quick and simple improvement. They also proved to be an easy means of capturing outside space. Homeowners could use awning-covered balconies, porches and patios at any time of day; grocery stores were able to convert sidewalks to outdoor display areas protected from sunlight and quick changes in the weather. 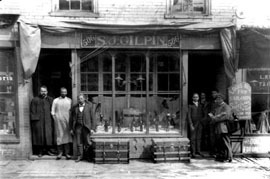 On Main Street, businesses used the expanded repertoire of awnings to draw attention to their buildings with bright colors, whimsical stripe patterns and exotic scallops. Awnings increasingly functioned as signs identifying the proprietor's name, goods on offer, or year of establishment. It was a trend that would culminate over a century later with awning installations in which shelter was secondary to advertisement. Scissor arm awnings have a pair of vertical, hinged arms on either side of the assembly supporting the front bar. To unfurl the awning, the roller is cranked and the arms extend outward pulling the cover away from the roller. Photo: NPS files. Awning development during the early twentieth century focused on improving operability. Variations in roller awnings addressed the need to provide an increasingly customized product that accomodated a wide range of storefront configurations and styles. New folding-arm awnings appeared that operated either vertically or horizontally supplementing the fixed-arm awnings developed in the latter 19th century. Vertical folding arms were made up of smaller hinged arms that crossed like scissors. Operated by gravity the arms extended outward pulling the covering off the roller. Like a fixed-arm awning, the pitch of a scissors-type awning varied depending on whether it was fully or only partially extended. Somewhat different was the "lateral arm awning" a horizontally operating awning that worked like a human elbow with the spring action in the arms pushing outward toward the street, unfurling the cover from the roller and maintaining tension. Lateral arm awnings featured a shallow drop that remained relatively constant regardless of how far the arms were extended Scissor arm awnings have a pair of vertical, hinged arms on either side of the assembly supporting the front bar. To unfurl the awning, the roller is cranked and the arms extend outward pulling the cover away from the roller. Operable awnings, whether fixed arm, scissors arm, or lateral arm, rapidly gained popularity as customers came to appreciate the flexibility, concealed appearance, and longer lifespan made possible by roller units. Lateral-arm awnings were preferred on long elevations, especially those with sheet glass (where vertical arms could not be fastened to the building façade). When lateral arm awnings were installed across a broad storefront or porch, manufacturers recommended spacing the arms at approximately eight foot intervals. Photo: NPS files. Slower to change was the fabric used to cover awnings. Canvas duck remained the common awning fabric during the first half of the twentieth century. However, its tendency to stretch and fade, and its susceptability to mildew, and flammable materials like cigarettes and matches motivated the awning industry to search for alternatives. Shortly after World War II, a vinyl plastic coating that increased fade and water resistance was first applied to the canvas. By the 1960s, vinyl resins, acrylic fibers and polyester materials were all being used to provide a longer-lasting awning cover. Ironically, just when these innovations promised more durable awnings, the fabric awning industry felt the debilitating impact of changing architectural fashion, the widespread adoption of air conditioning, and the increasing availability of aluminum awnings. Modernism dominated commercial architecture during the postwar era. The style's signature form-austere steel, glass, and concrete boxes-had little use for fabric awnings. Colorful awnings seemed old-fashioned, an unwanted distraction from the smooth lines of the machine aesthetic. The preference, instead, was for perforated structural screens or brises-soleil (French: "breaks the sun") that integrated shading functions with new building forms. It was assumed that new buildings had no need for awnings. Widely available for the first time, mechanical air conditioning threatened to make the awning an unnecessary vestige of an earlier era. Awning companies fought back with arguments that traditional shading systems could reduce the required size and investment in air conditioning systems. Though canvas awnings continued to be used on contemporary buildings, new types were often selected to do the job, aluminum and fiberglass awnings. Widely available by the 1950s, aluminum awnings were touted as longer-lasting and lower-maintenance than traditional awnings. Though used on small-scale commercial structures, they were especially popular with homeowners. Aluminum awnings were made with slats called "pans" arranged horizontally or vertically. For variety and to match the building to which they were applied, different colored slats could be arranged to create stripes or other decorative patterns. 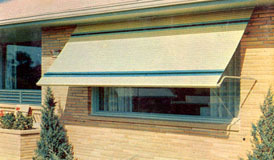 While aluminum awnings were usually fixed, in the 1960s several operable roller awnings were developed, including one with the trade name Flexalum Roll-Up. The years after World War II saw the widespread adoption of aluminum awnings on both storefronts and residences. Operable aluminum awnings incorporated a spring-loaded roller into the frontbar. Photo: NPS files. Also during this period, manufactured flat-metal canopies were an increasingly popular feature, used in new commercial construction and when remodeling existing storefronts. They were particularly common in the South where shading was critical to the comfort of both window shoppers and store interiors. Often made of aluminum, the canopies could stretch across a single facade, or be connected to extend along an entire block. An increasing reliance upon fixed aluminum frames and plastic coverings, spurred the development of new awning shapes during the 1970s and 1980s. Often, the awning served as a business's primary sign. Mansard awnings, concave awnings, quarter-round awnings, and quarter-rounds with rounded dome ends appeared with increasing frequency. Most had vinyl or other plastic coverings that were touted as being more resilient than traditional materials. Featuring bold lettering and colors that were often emphasized by illuminating the awnings from within, these awnings were common on new commercial strips and were even popular inside enclosed shopping centers and food courts. They were also applied, less successfully, to older or historic buildings where their shape, size, and material bore little resemblance to traditional awnings. Although the 1950s and 1960s saw the end of the canvas awning's ubiquity on Main Street, it remained a moderately popular feature of residential architecture. New materials and technologies such as lateral arm operators, acrylic fabric, and aluminum kept the awning relevant to the postwar ranch house and afforded an economical way to update older structures. Colorful awnings helped suburban dwellers distinguish their homes from other, similar, models in the neighborhood. Today, awnings come in a variety of shapes, sizes, frames and fabrics. Fixed, quarter-round, back-lit awnings with broad faces featuring company names, logos, phone numbers, and street addresses function more as signs than sunshades. Restaurants and other commercial chains use illuminated awnings with nationally recognized brand graphics and stripe and color patterns to attract customers along suburban strips. The triangular shed frame shape has enjoyed a resurgence of popularity in recent years, in many cases playing off nostalgia for the traditional awning. Relatively new "staple-in" awnings with a shed shape are commonly used on new commercial construction. This system has a welded frame of extruded aluminum with a slot on the outer edge. The fabric covering is pulled taut, and the ends are secured in the groove with galvanized steel staples. A vinyl trim bead covers the groove, protecting the fabric edges and providing a flush appearance. Apart from the strip mall, awnings are also reappearing in historic business districts and residential neighborhoods. In these locations, new awnings typically feature fixed frames or operating lateral arms-both differing little from the awnings of one hundred years before. Fixed frame awnings have frames made of either aluminum or light-gauge galvanized or zinc-coated steel pipes welded together. Frames are secured to building facades with clamps, z-shaped clips, and other hardware. Until recently, operable awnings found in historic commercial districts were primarily those with historic frames and hardware that had survived to the present. But new lateral arm awnings with powder-coated aluminum frames are an increasingly common choice for building owners who want the convenience of an operable system. Solution-dyed acrylics and acrylic-coated polyester-cotton blended fabrics are often used to replicate historic awning coverings. These relatively new materials resemble canvas in appearance and texture, yet offer greater strength and durability. Because acrylics are woven (with the stripes and colors woven directly into the fabric rather than painted on the surface), they are durable and allow light to filter through while keeping heat out. They dry quickly, thereby reducing damage caused by mildew, and contain a UV inhibitor that further reduces sunlight damage. Poly-cotton fabrics coated with a thin acrylic layer that repels dirt and resists abrasion are also used. Both acrylic and poly-cotton fabrics do not stretch or shrink like traditional canvas so they are generally easier to measure, cut, and install. This 1950s-era dry cleaner has an aluminum awning that, with its vertical pattern and alternating stripes, complements the facade's porcelain enamel panels and aluminum mullions. The awning forms an essential element of the building's historic character. Photo: NPS files. If awnings already exist on a historic building, they should be evaluated to determine whether they are appropriate to the age, style, and scale of the building, using the criteria identified below. Backlit awnings and dome awnings are usually inappropriate for 19th century and other historic buildings, while aluminum awnings may be perfectly compatible with buildings from the 1950 or 60s. The time is approaching when some aluminum awnings may even be considered appropriate to older buildings, if the awnings formed part of an updated storefront, or are central features of an intact postwar refashioning of the building's exterior. When an existing awning is determined to be appropriate to the building, a program of repair and regular maintenance should be developed. The condition of its covering, hardware, connections between the hardware and the building, and the awning's operability should be evaluated. Hardware such as arms, rollers, and gearboxes may only need cleaning and lubrication. In other cases more substantial repairs by an awning company familiar with historic hardware may also be needed. The best preservation practice is to maintain and repair historic features. The proper care and maintenance of existing awnings and canopies will extend the life of both hardware and covering while ensuring the safety of those passing beneath them. Parts for historic hardware can still be obtained from some suppliers, either from existing stock or as newly manufactured pieces. In some cases, new marine and boating hardware can substitute for missing historic awning hardware. Damaged pieces of the still popular galvanized pipe frames can easily be bent back into shape or, if necessary, replaced with virtually identical material. These fiberglass "clamshell" awnings, although not as old as the 1930s building to which they were affixed, are important features that have acquired significance. They were retained when the building was recently rehabilitated. Photo: NPS files. Ongoing maintenance consists of keeping all pivot points and gears lubricated and clean of debris. Regular inspections should also include checking for rust on the frame and hardware. Such areas should be promptly scraped and painted, as rust may discolor and deteriorate fabric coverings. When awning hardware is properly repaired and maintained, its lifespan can be significantly extended. Exposure to the elements and the limited lifespan of even new acrylic fabrics mean the repair and replacement of the covering will probably occur more frequently than any work on the frame or hardware. The longevity of any fabric covering is largely dependent upon where it is installed and how it is cared for. 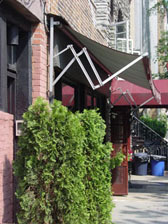 Awnings beneath overhanging trees, for example, are vulnerable to sap, fruit, and animal droppings that contain acids, which can deteriorate and discolor fabrics. Branches, flags, banners or other objects brushing against an awning can abrade the awning fabric. 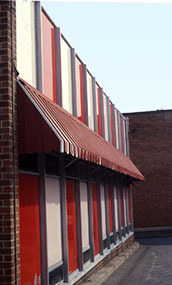 With proper care acrylic fabrics on fixed awnings have a service life of eight to fifteen years of year-round exposure. Regular cleaning will lengthen the lifespan of any awning. About once a month the covering should be hosed down with clean water. Choose a sunny day so that the fabric dries quickly and thoroughly. Keep retractable awnings extended until they dry completely. The awning underside can be kept clean by brushing it with a household broom. Regular cleaning helps prevent dirt from becoming embedded in the fabric. At least twice a year the awning should be gently scrubbed using a soft brush and a mild, natural soap (not a detergent) and rinsed with a garden hose. Every two or three years, professional cleaning is recommended. During this process, the covering is usually removed from the building, washed, and treated with an appropriate water repellant solution. Local awning companies may offer this service or the building owner can ship the covering to a specialty awning cleaning firm. Depending on the frame style and fabric, some awnings may be cleaned without being removed. While most fixed awnings remain in place year round, they last longer if taken down at the end of the warm weather season. Preferably, coverings should be removed by an awning service that can clean them, restitch seams if necessary, and store them for the winter. Property owners removing awning coverings themselves need to store them in a dry place with good air circulation. If a covering begins to sag between cleanings, the cause (an object on top stretching the material, loose laces, a damaged seam) must be addressed as soon as possible. When other maintenance or repair work is undertaken on the building, it is advisable to remove fixed awnings temporarily, as they are easily damaged or stained by materials dropped from above. Although more durable than in times past, awning covers can still develop tears and holes caused by ladders, falling trees, and vandalism. Fabric nearing the end of its service life is most vulnerable to tearing along the seams. Though awning companies are usually called to undertake repair work, enterprising owners can undertake some work themselves. If the damage is minor, repair work may be done while the awning remains in place. Small holes or tears in acrylic coverings can be immediately treated with a hot needle or awl that will melt the frayed edges and prevent the damage from spreading. Patch kits are available that function like band-aids, keeping the torn edges together. These patches, glued or sewn to the fabric, let the awning color show through but do have a semi-gloss sheen to them. Significant damage requires removing the covering and, usually, sending it to a sewing shop. There, work may include inserting a patch, restitching seams, or replacing an entire fabric panel. If the awning is relatively new it is possible to obtain a good match between replacement and original material. Since awning fabrics are subject to weathering and deterioration and hardware is exposed to the elements, some awnings may be beyond repair. Depending on the circumstances, new awnings may replace deteriorated existing awnings in kind or be installed where awnings were once in place as seen in pictorial or physical documentation. In other instances, they may be newly installed where no awning previously existed, provided they are compatible with the historic building. Whatever the circumstances, it is important to select an appropriate awning shape, material, frame dimensions, signage (if any), and placement on the facade. A gearbox, slide rod, roller, front bar, and extension arm reveal that this 19th century facade once featured a retractable awning. It is likely that with minor repairs the surviving hardware could again be made operable, recovered with a canvas or acrylic fabric, and reused to service the storefront. Photo: NPS files. If the condition of a historically appropriate existing awning is beyond repair, it should be used as the basis for selecting a replacement. When a historic awning is missing, owners should first look for evidence of a previous awning installation. Evidence can be either physical or documentary. The existence of surviving hardware-rollers and arms, gearboxes, clamps and other fasteners-or signs that hardware was once in place, such as bolt holes or recessed roller boxes-are the most likely forms of physical evidence. Storefront remodeling projects often uncover concealed and disused awning hardware that can either be repaired or at least suggest what type of awning was formerly in place. This is especially true for awnings that had an operating rod, gearboxes, and perhaps motors concealed in recesses within the building wall. Protected from the elements, these items are likely to survive in repairable condition. Sometimes physical evidence of earlier awnings can be found in the basement or upper floors where hardware and even old coverings may have been stored after being removed from the facade. Clamps, fasteners, and bolt holes in an exterior wall can reveal the position, type and dimensions of a missing awning installation. Fittings or other marks on the side of the entrance or windows, for example, suggest that a fixed-arm awning was present rather than a lateral-arm awning. Gearboxes point to a retractable rather than a fixed awning. 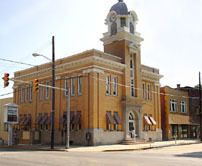 When the county clerk in Morgan County, West Virginia was looking to reduce glare in the courthouse offices she located a 1940s photo showing sets of awnings on the first floor. Photo: Frances Widmeyer and Debra Kesecker. Historic photographs and drawings are a primary documentary resource used to determine an earlier awning configuration. Photographs have the added benefit of providing information about the covering, such as stripe pattern, valance type, and lettering. When old photographs indicate that the historic character of a building was defined in part by distinctive awnings, it is appropriate to install new awnings that replicate their appearance. If there is evidence that awnings were once present but no information about their color or signage is available, a color should be selected that is in keeping with the historic character of the building and district. 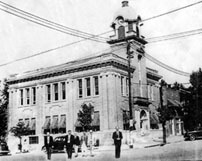 Using the historic photos as a guide (see photo, above, left), new awnings with a similar shape and stripe pattern were installed increasing the comfort of employees and protecting county records from direct sunlight. Photo: NPS files. Where no awning currently exists, and there is no evidence of a past one, it may still be possible to add an awning to a historic building without altering distinctive features, damaging historic fabric or changing the building's historic character. A new awning should be compatible with the features and characteristics of a historic building, as well as with neighboring buildings, or the historic district, if applicable. Historic photographs of similar neighboring buildings with awnings, can also be helpful in choosing an appropriate installation. When selecting and installing a new awning, a number of other factors should be considered: shape, scale, massing, placement, signage, and color. Simple shed-type awnings with acrylic or canvas coverings and free-hanging valances are appropriate for most historic residences featuring rectilinear openings. Photo: NPS files. Traditionally, both residential and commercial awnings were triangular in section, usually with a valance hanging down the outside edge. Early examples of these "shed" awnings had simple frameworks consisting of pipes or planks angling out from the building facade and supported on posts. Early retractable versions continued this triangular form. New awning shapes appeared in the later 19th century to accommodate the expanding variety of door and window configurations. Casement window awnings were box-like in shape to accommodate the outward swing of the vertical sash. Window openings with arched tops, such as those found on Italianate houses and commercial buildings, were often shaded by awnings with matching tops. A dome awning was an inappropriate addition to this circa 1890s building. In order to qualify for historic tax credits the new vinyl awning was replaced with a shed awning with a canvas-like woven acrylic covering. Photo: NPS files. Generally, traditional shed awnings are appropriate for most historic window, door, and storefronts installations. It is preferable (and in some historic districts, required) that these awnings have free-hanging valances, the flapping bottom pieces so characteristic of historic awnings. Quarter-round awnings, modern mansard awnings, and other contemporary commercial designs with distended, fixed valances have no precedent in traditional awning design and are usually inappropriate for historic buildings. Likewise, staple-in systems are not recommended for historic buildings. One of the distinctive features of a staple-in system is an exceptionally taut and wrinkle-free appearance; indeed, this is a chief appeal of the system when applied to new construction. Historic awnings, however, were either retractable or built with a covering laced onto a frame. Both forms had a fair amount of give in the fabric. Staple systems, especially those with long valances, usually present an appearance more suited to newer construction. While not recommended for installation on most historic buildings, they may be appropriate for infill construction within a historic district. Single awnings should not be set over more than one door or window bay. A separate shed awning with a canvas or acrylic covering would be more appropriate over each of these openings. Photo: NPS files. Because their primary purpose was functional rather than decorative, awnings were traditionally installed only where necessary. Window awnings were most commonly found on building elevations with southern exposures in the northern areas of the United States and on elevations with both northern and southern exposures in the southern United States. They were also found on east and west elevations, and sometimes just on selective windows. Retractable awnings were originally more common in northern climates where awnings required additional protection from extreme weather conditions. These window awnings today match what would have appeared in the 19th century. The fabric is slightly loose on the frames, the valances hang freely, each window bay has its own awning, and the awning frames are set within the openings. Photo: Mike Jackson. The design of a particular commercial building influenced the placement of its awnings. Some storefronts with traditional glass transoms had the awning placed below the transom, others had the awning installed above the transom. On both commercial and residential buildings, awnings were only wide enough to cover the window openings that they sheltered; a single awning rarely covered two or more bays. On storefronts, they were not higher up on the building faÁade than was necessary to shade the entrance and display window. Thus, it is important when installing new awnings on historic buildings to ensure that the covering not obscure the building's distinctive architectural features. This postwar aluminum awning does not contribute to the character of this 19th century residence and could be replaced during a rehabilitation project with a fabric shed awning more in keeping with the building's age and appearance. Photo: NPS files. Also, new awning hardware should not be installed in a way that damages historic materials. Clamps and fasteners used to attach awning frames should penetrate mortar joints rather than brick or other masonry surfaces. If new backboards and rollers are installed, care needs to be taken not to damage cornices or transoms. Finally, awning placement, size, and shape must be compatible with the historic character of the building. 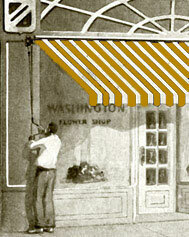 Historically, awnings were covered with canvas that was either solid in color or painted with stripes. During the second half of the twentieth century canvas fell out of favor and was superceded by vinyl and other synthetic textiles. For various reasons - particularly its reflectivity and texture-vinyl is generally an unsuitable material for awnings on historic buildings. Many historic review commissions note the inappropriateness of vinyl in their guidelines and call for the use of canvas, canvas blends, or acrylics that resemble canvas. Weather-resistant acrylic fabrics such as solution-dyed acrylic and acrylic-coated polyester-cotton approximate the historic look of canvas coverings, yet afford a new level of durability, color-fastness, and ease of use. Quality poly-cotton coverings may be more appropriate in some cases because, like traditional awnings, the colors and stripes are painted directly on the upper surface, while the underside remains a pearl gray color. Appropriate lettering, as on this roller awning valance, can function as distinctive signage without detracting from the historic character of the building. Photo: NPS files. In addition to sheltering shoppers and merchandise, and reducing glare and temperatures, awnings on commercial buildings offer valuable advertising space. Photographs from the mid-19th century show a wide range of lettering and logos- business names, types of trade (hosiery shop, telegraph house), street numbers-on the sloped coverings and side flaps of awnings. The most common placement of a shop proprietor's business name or service was on the valance hanging down from the awning edge. The front valance provided a flat surface visible whether the awning was retracted against the building wall or fully extended. Many establishments, however, left their awnings unadorned without any lettering. Today creating large lettered signs on a new awning as part of a rehabilitation project requires special care and is not appropriate in all cases. Used long before any local signage control, historic examples of such lettering often reflected the character of a district, with more upscale retail areas, for example, being more reserved than wholesale districts. Contemporary awning lettering can add visual interest and commercial identity but should be designed in keeping with the historic character of a building and its historic district. The green and burgundy stripes that decorate these porch awnings complement the matching shutters and brick facade. Photo:NPS files. As in the past, variety in awning color is an appropriate characteristic when reintroducing awnings in historic districts. Since the 19th century, awnings have featured a range of different stripe patterns and an extensive color palette. These lively, even whimsical, designs embellished building facades like a necktie or scarf does a suit. The vibrancy they lent to city streets and neighborhoods is part of the history of these environments and similar results can be achieved today as well. Because commercial awnings often extend into the public right-of-way, municipal building departments usually regulate their use. Regulations specify construction type (materials and dimensions of framing members, the use of flame retardant fabrics), minimum height above the sidewalk (usually between seven and ten feet), minimum distance between the projecting edge and the curb (usually between one and two feet), and maximum projection from the building wall. Such regulations are meant to ensure that awnings are securely built, do not pose a threat to pedestrians, and are not at risk from widely-loaded trucks. Lettering, color, and the relationship to adjacent awning designs may also be subject to building department review and approval. Local historic district commissions and neighborhood improvement associations often publish awning guidance on their websites. Image: Ripon Main Street, Inc.
Awning work on buildings located in historic districts will likely be reviewed by a historic district commission (HDC). HDCs may also review grant applications and recommend approvals for facade improvement programs, where such programs are in place. Though commissions look at projects on a case-by-case basis, many have established guidelines that address general issues and local concerns relating to awnings and canopies. Often, local design guidelines are modeled upon The Secretary of the Interior's Standards and Guidelines for Rehabilitating Historic Buildings. These standards set forth principles meant to ensure that new elements are added sensitively, do not damage historic fabric, and are compatible with the historic character of the building. Like all exterior building features that are subjected to snow, rain, sunlight, wind, and pollution-awnings need regular attention. Covered even with modern materials, they require maintenance, repair, and eventually replacement. Awnings are often the first feature to be altered when historic buildings change owners or uses. They often have a significant role in contributing to the historic character of a building. It is important that owners, architects, engineers, historians, and others consider this when planning work on a historic building. Awnings offer a number of benefits to owners of historic buildings. Awnings can make unnecessary a host of other alterations made to buildings in the name of energy efficiency. Awnings provide nearly comparable glare reduction and reduced heat-gain as tinted windows or window films, yet are in keeping with the historic appearance of a building facade. They help protect historic windows and storefronts, and allow windows to remain open, and cool air to circulate, even during inclement weather. In warm climates, they reduce the need to replace existing windows with new units with insulating glass for the purpose of energy conservation. 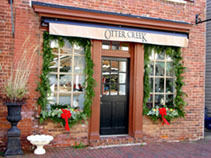 In some commercial districts, local "main street" associations, chambers of commerce, or business improvement district offices offer assistance for awning rehabilitation projects. Such organizations may sponsor grant programs or low-interest loan programs with funds that can be used for awning work. These initiatives, often bundled with facade improvement and signage programs, enhance the visual character of a street or neighborhood, encourage conformance with guidelines, and offset what is in some cases the higher cost of a historically appropriate installation. When a building is located within a historic district, additional grants, loans and tax incentives may exist. The availability of funding assistance, in these cases, is usually contingent upon completing rehabilitation work in keeping with established preservation practices. Chad Randl is an Architectural Historian with Technical Preservation Services, Heritage Preservation Services Division, National Center for Cultural Resources, National Park Service in Washington, D.C. The author wishes to thank the following for their assistance in the preparation and review of this brief. Scott Massey of Awning Cleaning Industries; Walter L. Conine of John Boyle & Company, Inc.; Jacob I. Luker of Muskegon Awning; Steve Morenberg of Reeves Brothers, Inc.; Karen Musech of the Industrial Fabrics Association International; Robert Montgomery of Montgomery Shade & Awning, Ltd.; Michelle Capek of the Astrup Company; Bruce N. Wright of Fabric Architecture; Lincoln H. Christensen of Anchor Industries, Inc.; Mike Jackson, FAIA, of the Illinois Historic Preservation Agency; Stephen Stowell of the Lowell Historic Board; Sharon C. Park, FAIA, Michael J. Auer, Kay D. Weeks, Anne E. Grimmer, Lauren Van Damme, and Charles E. Fisher of Heritage Preservation Services, National Park Service. This publication has been prepared pursuant to the National Historic Preservation Act, as amended, which directs the Secretary of the Interior to develop and make available information concerning historic properties. Comments about this publication should be directed to: Charles Fisher, Technical Publications Program Manager, Technical Preservation Services, National Park Service (Org. 2255), 1849 C Street, NW, Washington, DC 20240. This publication is not copyrighted and can be reproduced without penalty. Normal procedures for credit to the author and the National Park Service are appreciated. Unless otherwise indicated, photographs are from NPS files. Excepting NPS photos, the photographs used in this publication may not be used to illustrate other publications without permission of the owners. American Society of Heating, Refrigerating and Air-Conditioning Engineers, Handbook Chapter 30: Fenestration, Atlanta: ASHRAE, 2001. "Awnings Back in Style," Traditional Building, January/February 1997, 76. Chandler, Ernest, Awnings and Tents: Construction and Design, New York: Ernest Chandler, 1914. "Fusion of Old and New," Fabrics and Architecture, September/October 1994, 42-45. Muckenfuss, Laura A. and Fisher, Charles E., Preservation Tech Note: Windows Number 7, Window Awnings Washington, D.C.: National Park Service, U.S. Department of the Interior, and Georgia Institute of Technology, 1984. Morenberg, Steve, "Awnings Through the Ages," Industrial Fabric Products Review, September 1993. U.S. Department of Energy, Cooling Your Home Naturally, Office of Energy Efficiency and Renewable Energy Factsheet, DOE/CH10093-221, October 1994. White, Anthony G. Awnings, Canopies and Marquees: A Selected Bibliography, Vance Bibliographies, Architecture Series: Bibliography #A, 1986.